Any professional development hours that will count toward your CTLE MUST be through an approved CTLE sponsor. Make sure you get and KEEP certificates signed by your CTLE provider AND includes their CTLE number. If you are called for an audit by the State you MUST have ORIGINAL certificates to bring with you. Keep HARD copies. Do not count on digital unless you have multiple backup. ALL TEACHERS AND TEACHER ASSISTANTS START WITH ZERO HOURS AS OF JULY 1, 2016. THE PD 175 HOURS DO NOT COUNT FOR CTLE! 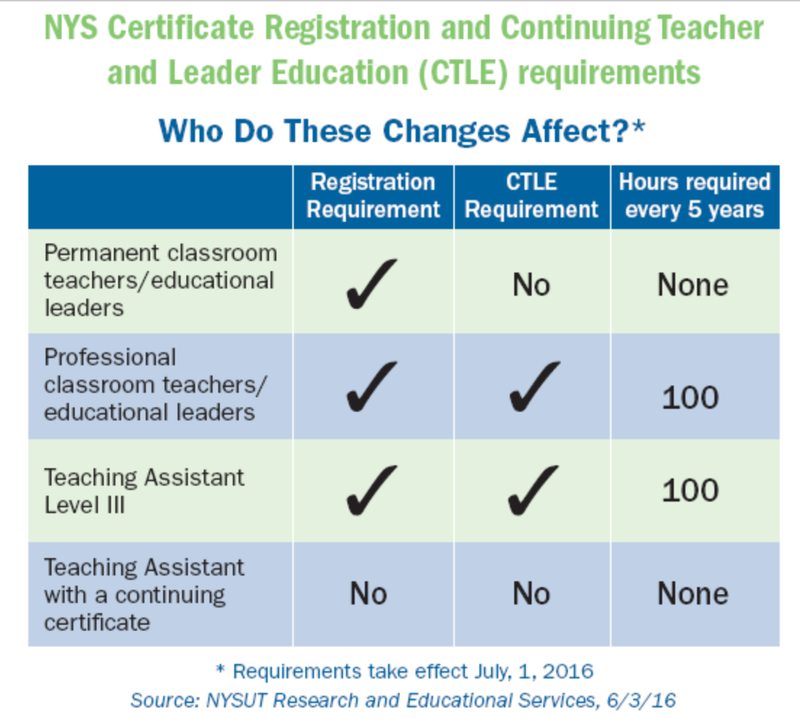 NYSUT has prepared a wealth of information regarding the new CTLE requirements as outlined in the above chart. I’ve included some of the information here. Click here for information regarding the Content Specialty Tests and Safety Net Information. Take content tests now: NEW CONTENT TESTS ON THE HORIZON!!! NYS is working with Stanford University to increase the rigor of the content tests. Complete 75 hours of acceptable professional development as prescribed in part 80-3.6 within the year prior to applying to the Department for the reissuance. Re-take and achieve a satisfactory score on the NYS Teacher Certification Exam, Content Specialty Test in the area of your certificate within one year of applying. *** Experience as a permanent sub DOES count; experience as a TA DOES NOT. *** ONLINE MASTERS: be careful! Make sure the educational institution is acceptable to the State. UNIVERSITY OF PHOENIX IS NOT! Check your TEACH account to be certain that your hours agree with your records for your professional development CTLE hours. When can I start accumulating my 100 hours? Your first professional development period begins on July 1 following the effective date of your Professional teaching certificate. A professional development year is July 1st – June 30th. Can I take the 100 hours before the 5 year period is over? Yes, you may. There is no specific requirement that the teacher may only accumulate 209 hours per year to reach the 100 hours; however, the State recommends that teachers do not take an overwhelming amount of hours in any single year. If I finish my 100 hours before the 5 year period is up, can I start accumulating hours for my next 5 year period? No. If you take 200 hours in a five year period ONLY 100 hours will count. You start at 0 hours every 5 years. What if I hold 2 professional certificates in different areas? You are only required to complete 100 hours in each five-year period. The five year period begins after the FIRST Professional certificate is issued regardless of the date of the second certificate. How many hours can I earn for inservice and graduate courses? Exactly what will Massapequa count toward my 100? It is your responsibility to keep a record of all professional development activities completed including those provided by the district.